I have been very aware for a while that Rethinking Poverty should be including climate change in its focus. But a gut feeling about the interconnectedness of everything isn’t enough; I wanted a clear connection between creating a good society without poverty and addressing climate change. 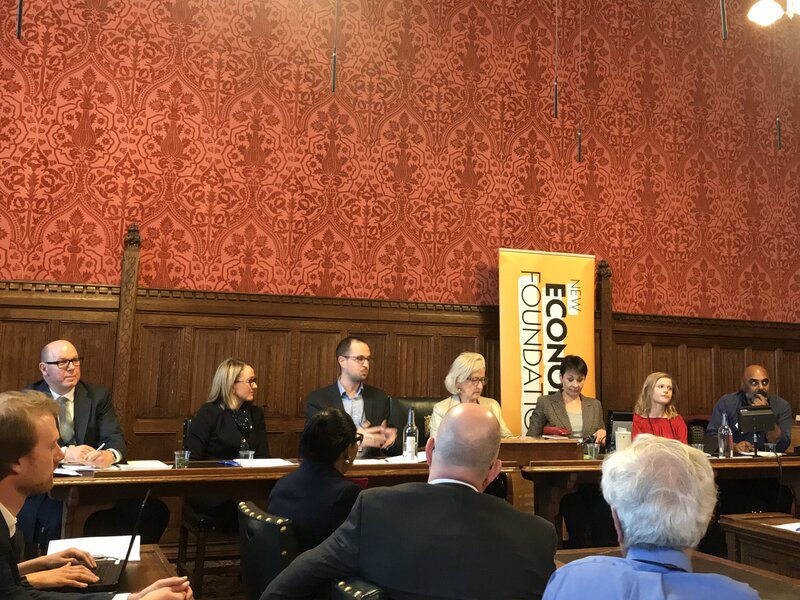 A meeting on ‘Good Green Jobs for All’, hosted by New Economics Foundation (NEF) at the House of Commons on 1 April, provided me with the connection I was looking for: the idea of a ‘just transition’ to a zero-carbon economy. Climate change is already a disaster for many, especially in the global south, and a catastrophic threat to all of us, said Rebecca Long-Bailey MP, Shadow Secretary of State for Business, Energy and Industrial Strategy. The meeting is timely, said Green Party MP Caroline Lucas, because we’re at a political, economic and environmental crossroads, with just 11 years left to address global warming. Last year’s hot summer was perhaps the first time people in the UK really felt the effects of climate change. The government doesn’t yet have the mandate we need for reducing carbon emissions, said David Powell, NEF’s Head of Environment and Green Transition. Essentially we have done the easy bits – moving from coal to gas and beginning to develop renewable energy – but we now need to focus on the ‘tricky bits’: how we work, how we travel, how we heat our homes, and how we develop renewable energy further so it can supply all our energy needs. ‘We need a national vision behind us,’ said Powell. ‘We need to redefine what is politically possible,’ said Lucas. 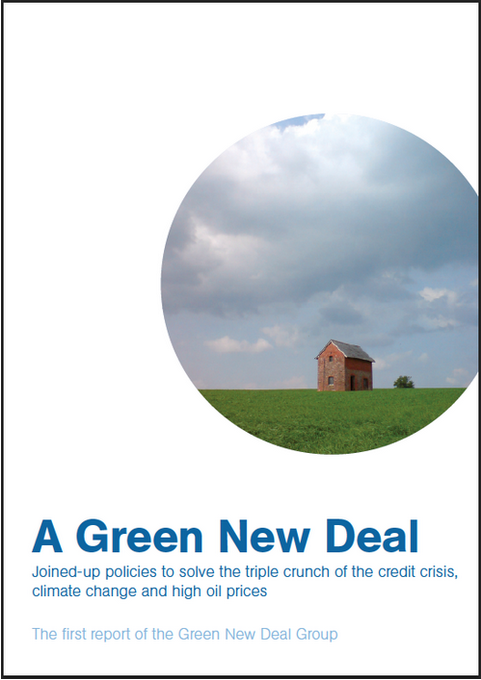 According to NEF, the Green New Deal is ‘a plan and a growing global movement … for huge investment in the economic future of the UK, to create a new generation of jobs in the industries and infrastructure we need to tackle the climate crisis’. The idea was first mooted in the UK in a report called A Green New Deal released in 2008 by the Green New Deal Group (including economist Ann Pettifor, chairing the 1 April meeting) and published by NEF. Unfortunately, this sank, said Pettifor. People were told the market would solve their problems and believed this. But now the Green New Deal is back. It’s being espoused in the US by Representative Alexandria Ocasio-Cortez, while in the UK a new group calling itself Labour for a Green New Deal has launched a grassroots campaign to push the party to adopt a radical Green New Deal to decarbonise our economy in a decade. This will involve a huge programme of public investment, focusing on energy use and carbon emissions in all sectors – though sectors such as energy, the car industry and home insulation will inevitably be priorities. A shift of public subsidies away from fossil fuels and into renewable energy will be needed. We will need to stop developing North Sea oil and gas, expanding airports, building new roads. Rural areas should also be a priority. Agriculture and forestry will play a key role in restoring sustainable systems and creating carbon sinks. As George Monbiot outlines in a recent Guardian article, restoring natural forests, allowing native trees to repopulate deforested land, and restoring coastal habitats such as salt marsh and seagrass beds can play a huge role in carbon capture. We also need to move away from the idea of growth. By 2050 the global economy is set to be three times bigger than at present; this is unsustainable. Environmental sustainability and wellbeing must be the goals of the new economy. We need to address people’s needs (food, shelter, education, jobs, etc), said Asad Rehman, executive director of War on Want, not their wants, which are potentially unlimited. The Green New Deal is a great opportunity to revive left-behind communities, said Long-Bailey. To get the public onside we need to focus on tackling climate change and creating economic opportunities to transform communities at the same time. Offshore wind in the North Sea could provide four times the whole of Europe’s energy needs, she said. Tidal power, agricultural science, carbon sequestration – all present huge opportunities. More of the steel needed by business could be made in the UK. The UK is falling behind in the global electric car stakes. Fifteen thousand people are likely to be made redundant in the next few years because of Honda’s plant closure in Swindon, partly because of the lack of market for electric vehicles. In Norway, by contrast, electric car sales rose from 37 per cent to 57 per cent of all car sales in a year, due to the government getting behind it. ‘We can’t do this without a government that is willing to intervene in the economy,’ said Long-Bailey. This could be through procurement, climate change-related industrial strategies, skills development, direct investment. Coordinated policymaking is needed across all government departments. If we do this right, she said, we could deal with the disruption from artificial intelligence as well as climate change. It could lead to a four-day week. This needs to be a place-based strategy, creating secure jobs to replace those that are lost. Replacing well-paid, skilled jobs with stacking shelves for Amazon and jobs in the gig economy won’t work. People will need new skills, so rapid ‘upskilling’ will be a critical part of building a new economy. The workforce we have now not is not up to our needs. Engineers and tradespeople are too specialised, not adaptable enough to be capable of introducing new and unfamiliar technologies. To give just one example, we will need a whole new home insulation industry, starting with experts to visit the 30 million homes in need of insulation to advise the owners on how to go about it. New careers must be created to meet the challenges we face. Social justice must be at the heart of the Green New Deal. The gilets jaunes protesting against President Macron’s carbon tax shows the need for this. Elites may be concerned about the end of the world, but most people are concerned about the end of the month. Moving to a zero-carbon economy presents a massive threat to those employed in carbon-intensive industries, so we need to ensure a just transition for all workers. Trade unions will have a big role to play. ‘The UK’s history of industrial transformation has not been a happy one,’ said Tim Page, the TUC’s senior policy officer. ‘The decline of the manufacturing sector has been handled badly.’ The TUC is about to publish a statement setting out the principles behind a just transition. This is now being roadtested throughout the country, but we can expect the statement to be strong on industrial strategy, skills training and workers’ voices being front and centre. People in fossil fuel industries are engaging with this, said Page, but we need to ensure their jobs are replaced with good jobs with equal skills. ‘We need to make sure solutions do come from below,’ said Clare Hymer, editor of Novara Media. One big risk she sees is that the Green New Deal won’t be directed by the right people. It needs to be backed by a real grassroots movement, but ‘we mustn’t just create a movement to support top-down policies’. There is also a global dimension to a just transition, emphasised Rehman. The UK needs to do its ‘fair share’. If the goal is a zero-carbon world by 2050, the UK needs to decarbonise by 2030 to allow countries of the global south more time to develop cleanly. Sixty per cent of the world’s people work in the informal economy. We need a just transition throughout the world, in formal and informal sectors, throughout supply chains. ‘We need to reimagine solidarity.’ Talking about migration, he said people should have the right not to move as well as the right to move – which most people don’t want to do. This means the right to food, shelter, energy, a living wage, social protection. Whatever happens with Brexit, ‘it has taken the lid off the rottenness in our country in terms of inequality,’ said Caroline Lucas. ‘The beauty of the Green New Deal is that it’s a win, win, win.’ Based on the creation of good new jobs in every constituency, it can address poverty and inequality, restore our environment and put our planet in order – all boxes ticked.